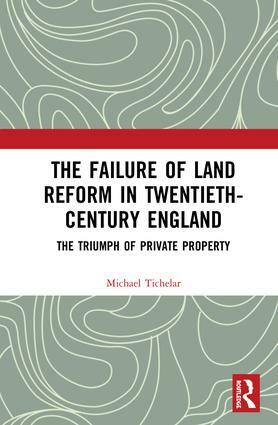 Based on a mixture of primary historical research and secondary sources, this book explores the reasons for the failure of the state in England during the twentieth century to regulate, tax, and control the market in land for the common or public good. It is maintained that this created the circumstances in which private property relationships had triumphed by the end of the century. Explaining a complex field of legislation and policy in accessible terms, the book concludes by asking what type of land reform might be relevant in the twenty-first century to address the current housing crisis, which seen in its widest context, has become the new land question of the modern era. Part IV: The Land Question and The Housing Crisis 1979 to 2017. Michael Tichelar is Visiting Fellow in History at the University of the West of England, UK, and author of The History of Opposition to Blood Sports in Twentieth Century England: Hunting at Bay.